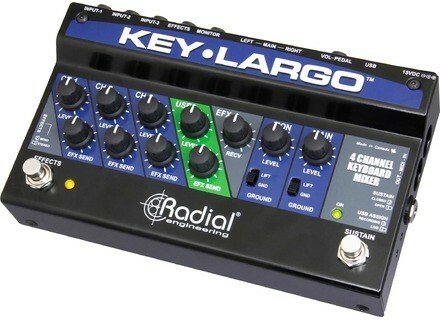 Key-Largo, Analog Mixer from Radial Engineering. Radial Engineering presents the Key-Largo keyboard interface - a keyboard mixer, DAC, effects loop and remote control all in a compact pedal format. The Key-Largo is a Tonebone first... 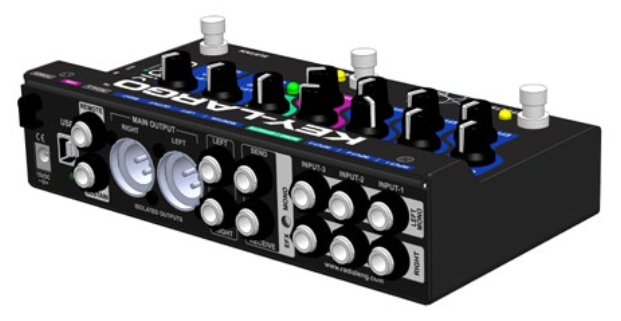 It is a combination keyboard mixer, DAC, effects loop and remote control in a compact pedal format. 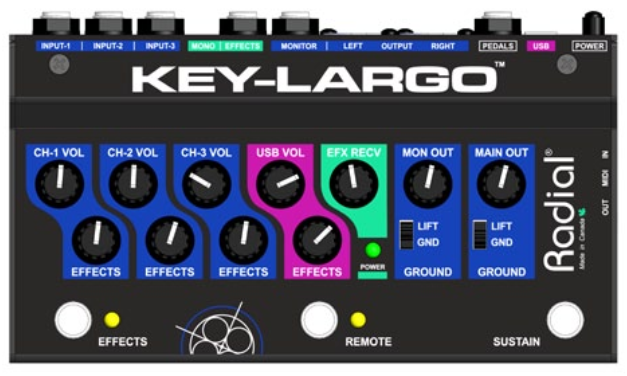 The Key-Largo features three stereo input channels for your analog synths, each channel being equipped with a level control and an effects send, while a 4th input for a USB connection allows to play back audio files and mix them with the live keys. A stereo effects loop (which can be remotely turned on or off using the left onboard footswitch) lets you add a rackmount delay or reverb. Finally, stereo direct outputs let you feed your stage monitors while balanced isolated outputs feed the PA system. A middle latching footswitch lets you activate a second effect in the loop, and a third momentary footswitch is assigned for sustain. Side access MIDI connectors are also available to pass-through data and add flexibility. No detail available as to its availability or retail price. [NAMM] A new tube EQ at Thermionic Thermionic has announced a new 19" stereo tube EQ, and as usual with the British brand it will sport a bird-inspired name: the Swift. [NAMM] A-designs presents the Reddi v2 A-Designs has presented the Reddi V2, a rack-mountable version of their Reddi all-tube DI unit. [NAMM] Morton KickTone bass drum microphone After a successful Kickstarter campaign, Morton Microphone Systems is at the NAMM Show to present their KickTone co-axial dynamic mic for bass drums.